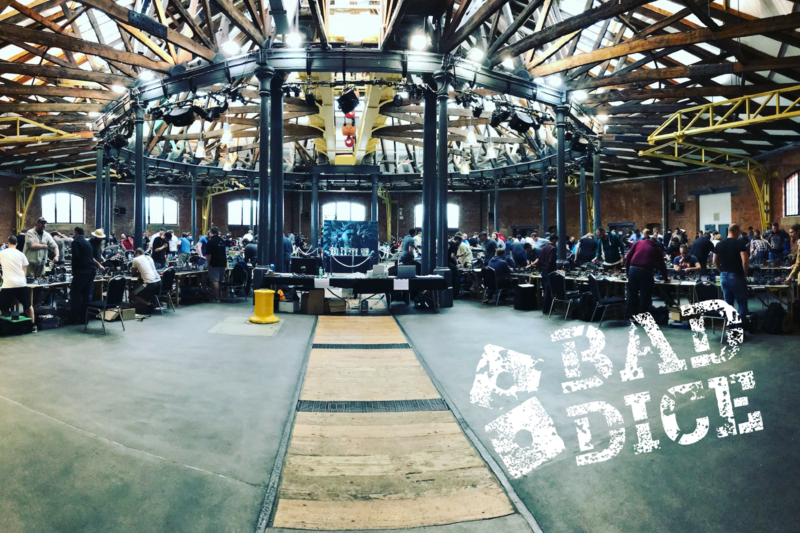 Here is the updated entry list for the Age of Sigmar championships. If your name is not on the list and you think it should be, please fill in the form at the bottom of the page. The Blood and Glory Age of Sigmar rules pack is here. This pack is 100% set in stone, there will however be an ADDITION to the pack to regarding TIEBREAKERS as a 200 player event with 5 rounds will result in a high number of players being on the same points totals for each bracket. We are working on a secondary objective system that will be in play in each of the games in the AoS Championships. These secondary objectives are still to be confirmed. This will not change the result of a game, the battle plan will still decide that, but they will be the difference in who will win the event when 2 players are on equal battlepoints. I want to post these by the 1st October but we ‘might’ leave it until registration to ensure they are properly tested. Some Highlights from the rules pack. Armies can be unto 2000 points and are selected using the Battlehost Rules and Pitched Battle Profiles. TERRAIN NOT REQUIRED. This year, we can happily tell you that all terrain will be provided for you. 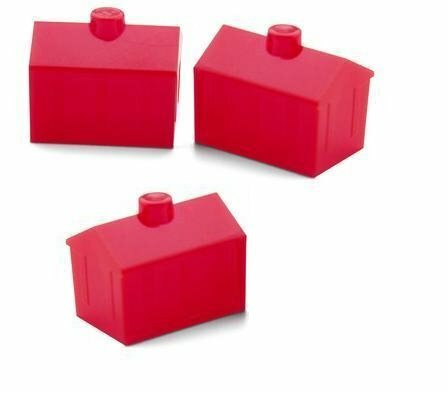 We’ll have a good selection of area semi LOS blocking and full LOS blocking terrain available for every table, so most armies should feel at home. When arriving at a table. If a piece of terrain is a Games Workshop model and has a Warscroll, then that Warscroll will be in use. Otherwise you should generate a terrain type using the Scenery chart. Each round we will be playing one of the 18 Battleplans from the Age of Sigmar Core Rules and the Generals Handbook (listed on Pg49 of GHB18). Additionally, we will be playing each round in a a different Realm of Battle and and using the Realm Magic, Realm Commands and Realmscape Features for that realm found in the Core Book and Malign Sorcery. The wonderful Steve Wren had made us a poster so gaming stores can display them for us to get the word out about the event. If you run a store or a gaming centre ad would like to help us out by displaying a poster please let me know and I will get one shipped out. This afternoon I am heading over to Warhammer World to talk to Ceri on Warhammer TV about one of my favourite hobby topics, community building. 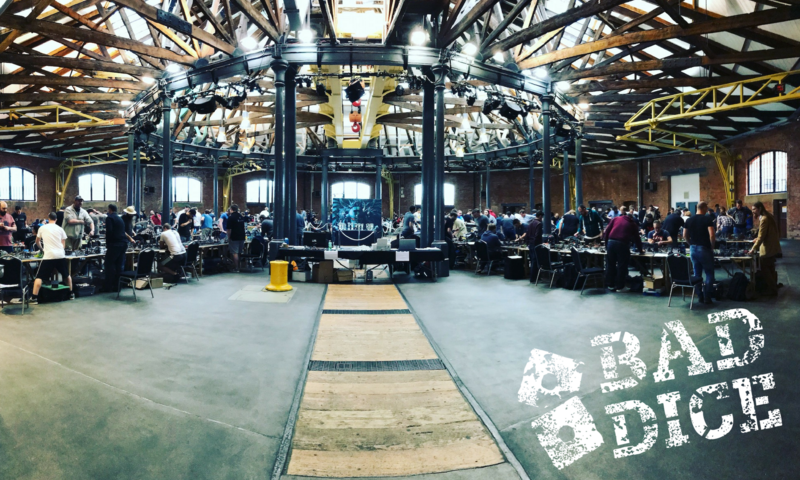 Myself and Ben Johnson from the Design studio will be talking about our experiences in the hobby setting up our local Age of Sigmar games club and give Ing ideas on how you can do similar. 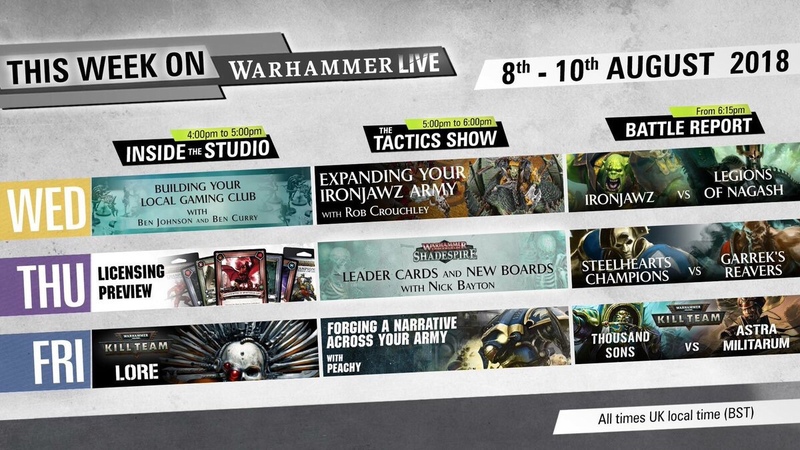 Check out the show at 4pm on Wednesday at Twitch.tv/Warhammer or subscribe to watch back later. 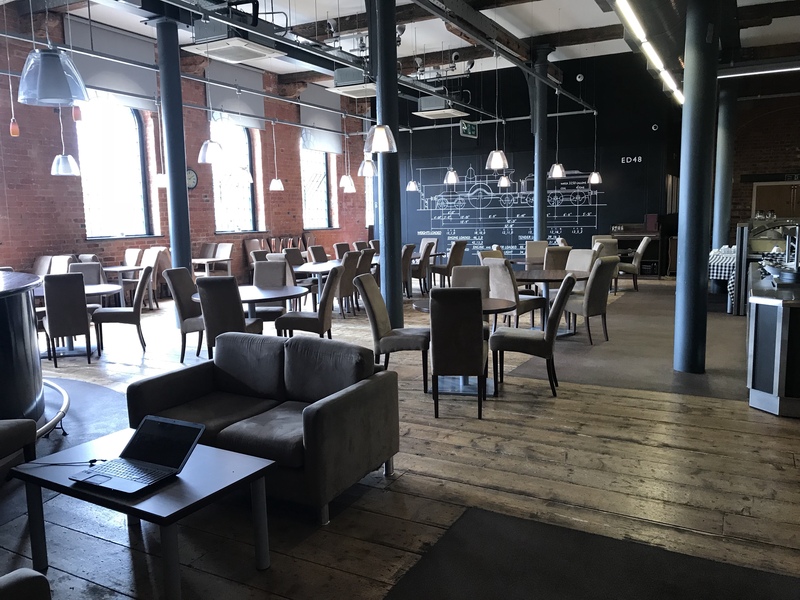 After reviewing space at the venue last week we are now able to open up more space for both Age of Sigmar and Horus Heresy. 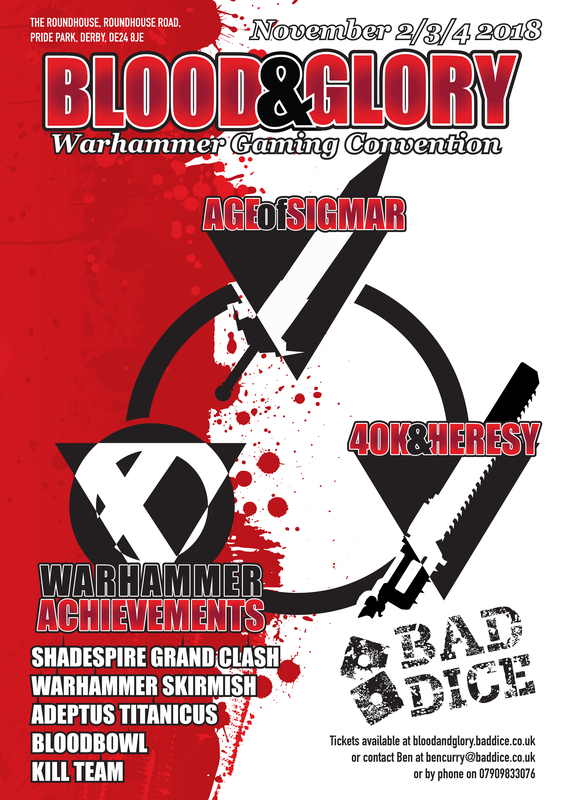 Age of Sigmar goes from 150 players to 200 and Horus Heresy from 50 to 100. If you have already picked up a reserve ticket it will be transferred to a place at the event. This means that we have already sold 170 places for Age of Sigmar. If you don’t want to miss out grab a ticket before they sell out again. 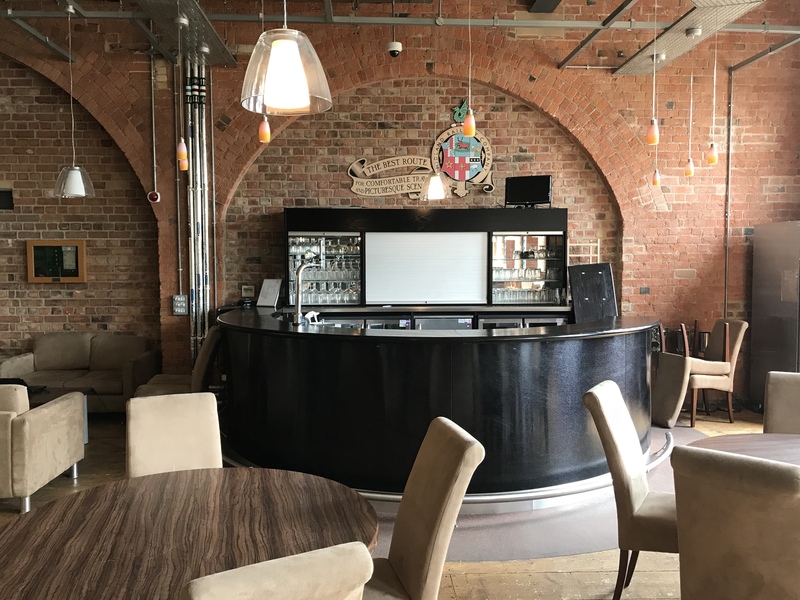 This year at Blood and Glory we are opening a bar area where you can hang out away from the event and chill out without being confined to the gaming areas. 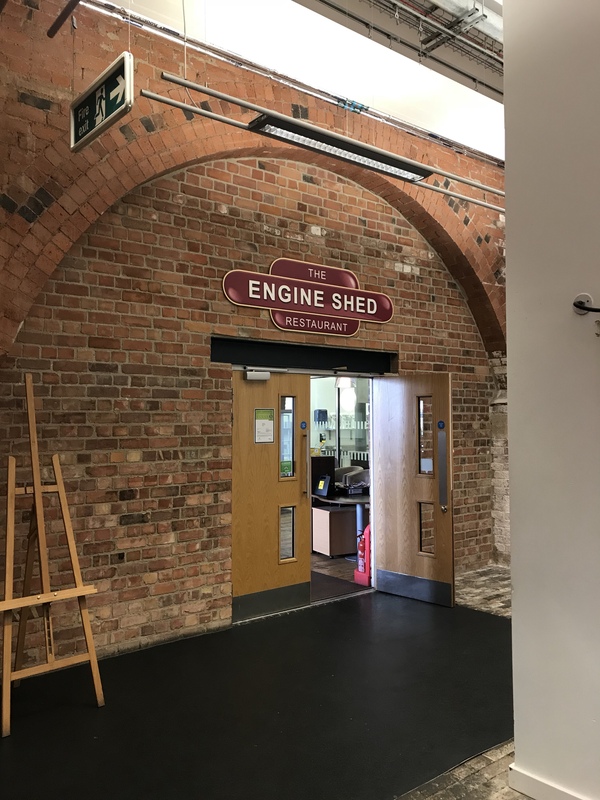 Located in the converted old Engine Shed house of Derby’s historic Roundhouse, the Engine Shed Restaurant boasts a handsome environment, steeped in railway history, creating a spacious and contemporary area. we have access here through out the weekend so if you are planning on heading out for drinks why not stay on site instead. 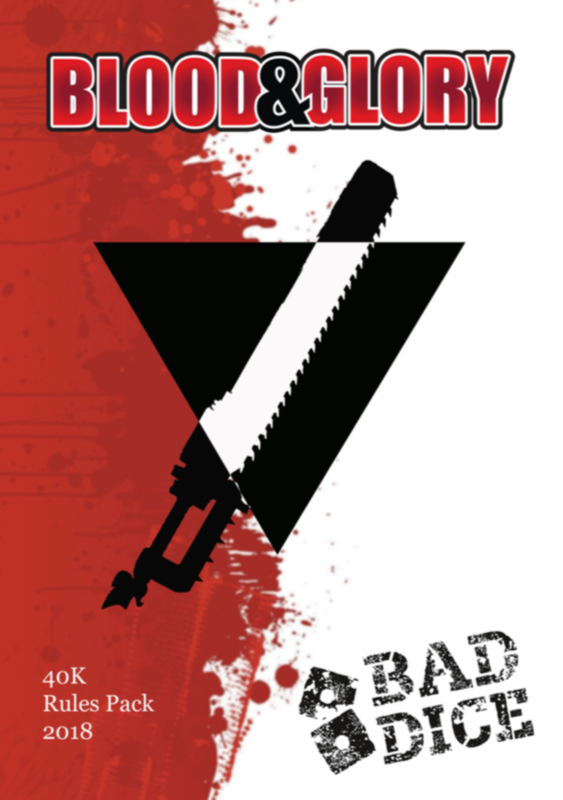 Warhammer 40,000 at Blood and Glory – Get the Rules Pack ! 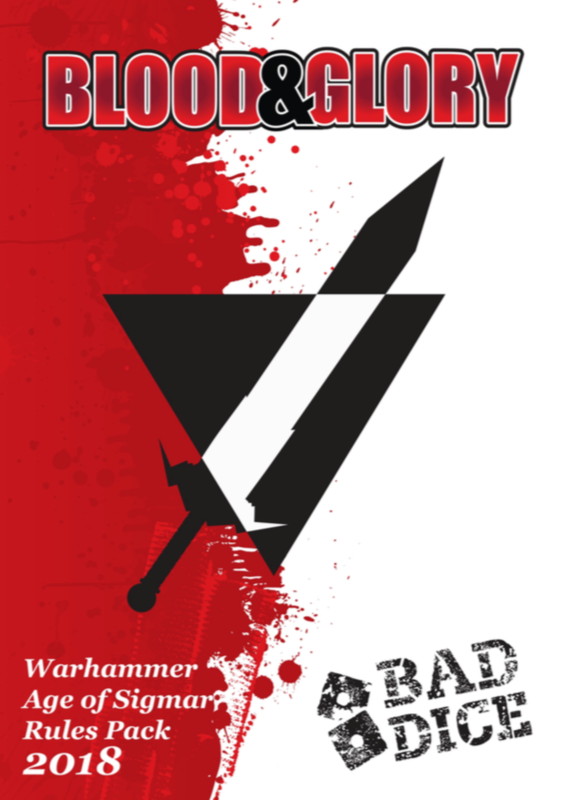 The Warhammer 40,000 Blood and Glory Champoinships rules pack is now up! New tournament Organiser Liam Jordan. 1750 points, Terrain provided, Missions from Eternal War and Maelstrom. The Warhammer Underworlds Grand Clash rules pack is now up! 2 full days of gaming. 4 Games on Saturday, with the final 8 playing off on Sunday. Anyone not making the final cut will be entered into a separate 3 game event on Sunday. #WiPWednesday is how we will be showing the progress made each week with the event. 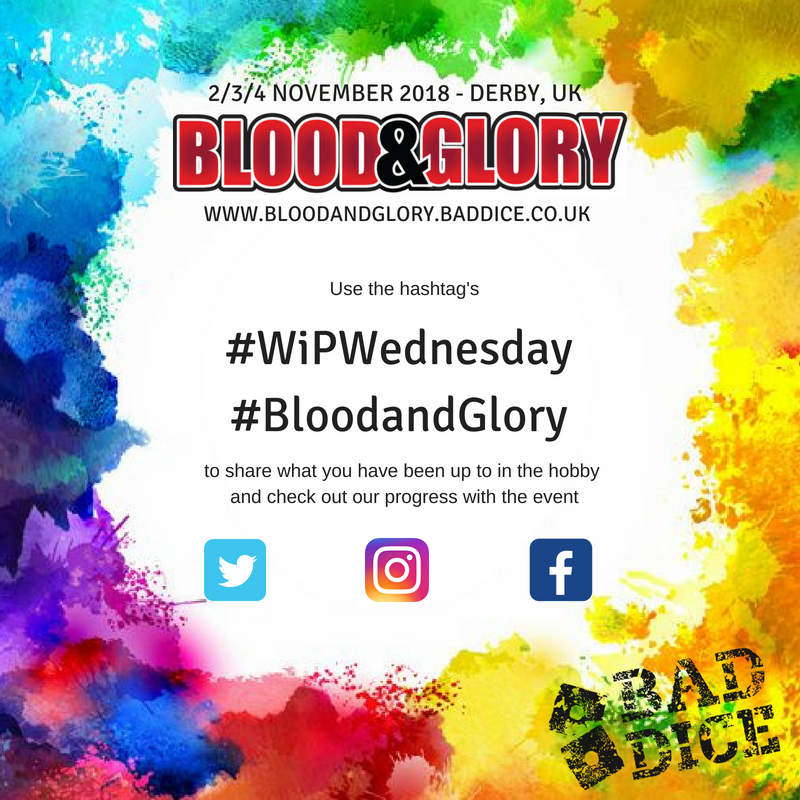 From terrain builds, to rules pack progress and table layouts each we we will be using the Hashtag #WiPWednesday and #BloodandGlory to put out an update about the Blood and Glory event. 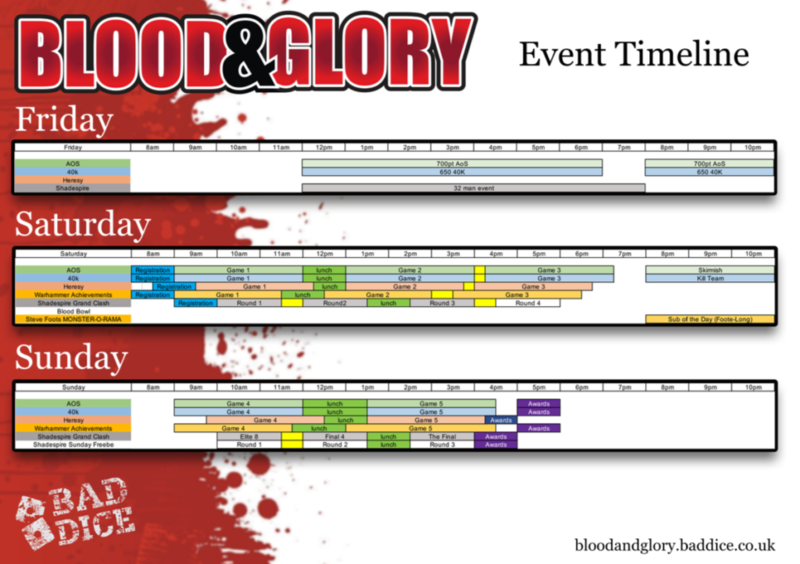 Feel free to join in the fun and share with us what you have been doing in the hobby and also in preparation for Blood and Glory. 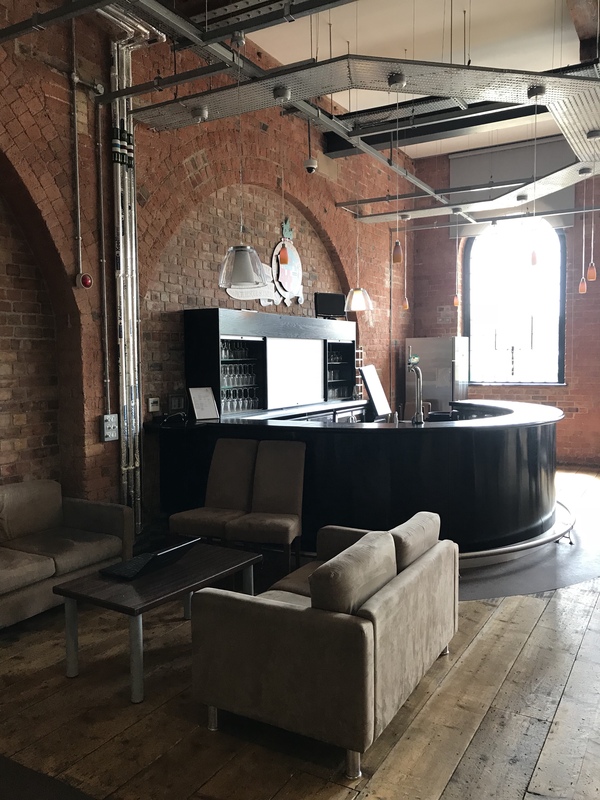 If you are coming to Blood and Glory 2018 then here is a useful list to help you find a hotel. 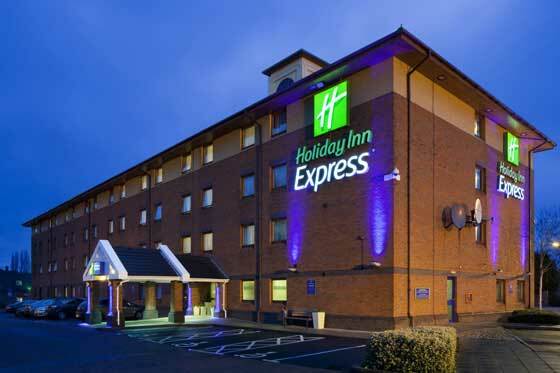 We are very close to the Derby Train Station and surrounded by hotels. Here is a list of the closest places to stay.